S. Stroock & Co was founded by Samuel Stroock who left his home in Tennessee in 1866 and trekked to New York to begin a small business in a loft, producing felt and carriage robes, or lap blankets, for the horse-drawn carriage trade. He eschewed the poor standards and practices of the times when "caveat emptor" was the by-word, and insisted upon offering only the highest quality; a novel approach that quickly led to "Stroock Carriage Robes" being synonymous with the best. Following on from blankets for horseless carriages, the company moved with the times by making them for the new but still airy horseless carriage, the motor vehicle. Samuel Stroock died in 1883 but the company remained in the family and was guided through World War I by Louis Stroock when it made army blankets and military uniforms. 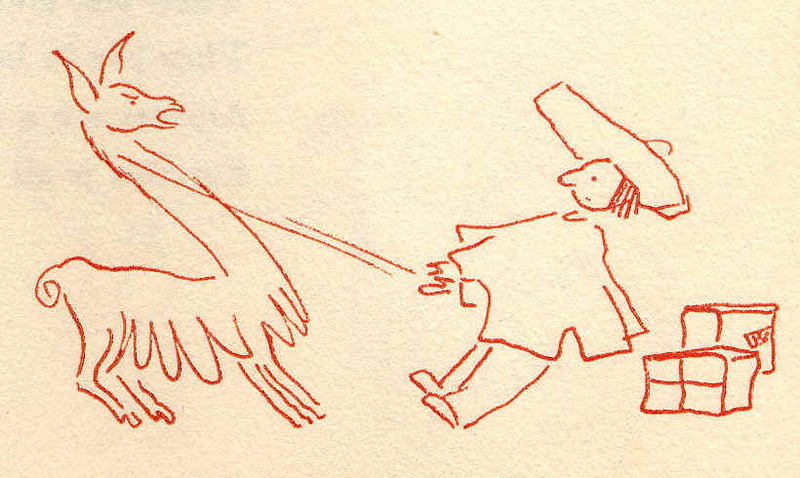 Louis's brother Joseph opened a sister company Stroock Felt, producing felted material. It was to meet this expansion that the family built a new factory at Newburgh-on-Hudson, New York State, and it was here that the company was to grow and its tall chimney stack become a feature of the Newburgh landscape for several decades. When Louis Stroock retired, his son Bertram took the company reins and expanded into luxury fashion fabrics. 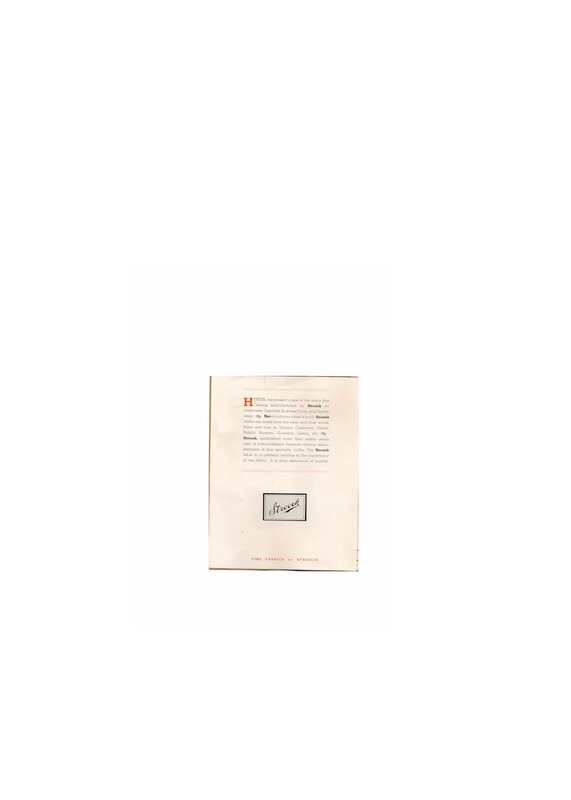 In 1919 B ertram produced the first 100% camel cloth. Sold on the slogan "warmth without weight" and with its delicate natural colour, it became an instant hit. Although all their carriage blankets had carried the Stroock label, their camel cloth was the first fashion fabric to do so and the name quickly became recognised in the luxury fashion world as a lead brand. By 1923 company profits had been lifted from an annual $6,000 to in excess of what was for the time, a magical $1m. In a most unusual move yet one which somehow befits this unusual and innovative company, when Bertram's father died in 1935, his mother Pauline decided it was time Bertram's younger brother Sylvan "deserved a chance" to run the company. Having steered Stroock & Co into a multi-million dollar organisation with offices on New York's Fifth Avenue and with mills at Newburgh, NYS, Bertram was not well pleased, despite being able to retire a multi-millionaire at just 44 years of age. Sylvan was equally enthusiastic about the unusual, rare and luxurious fabrics the company was developing. Following on from their success with camel hair and cashmere, Sylvan followed his brother in looking to the Andes for inspiration and the company's expansion continued apace. Fine fabrics were created not only from the four members of the camelid family - llama, vicuna, alpaca and guanaco - but even Huarizo and Misti, the crosses of male llama/female alpaca and male alpaca/female llama respectively, that today are completely unsung. .
Realising the uniqueness of their product, Sylvan Stroock set about marketing to and educating prospective owners of their creations with a series of small books he wrote himself. 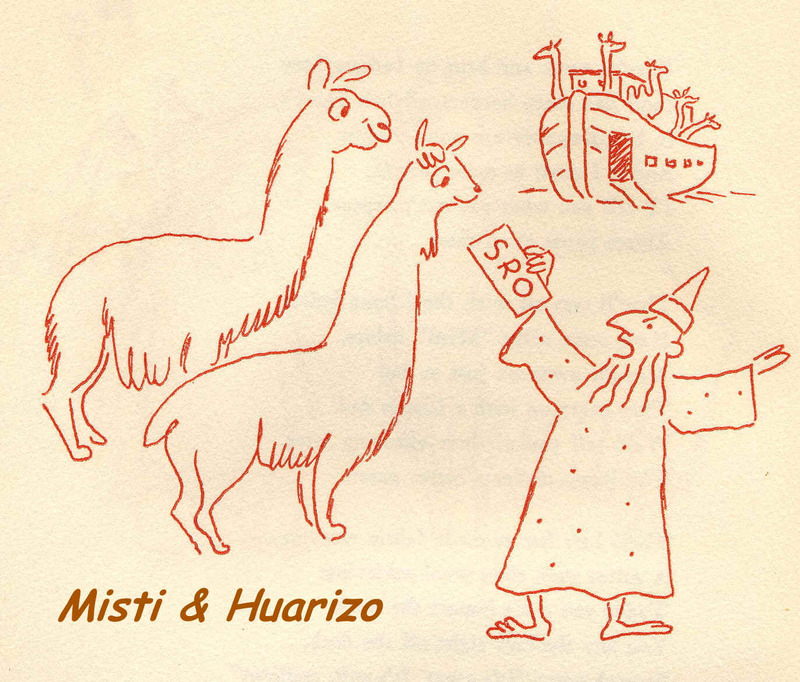 They included "The Story of Vicuna", "The Story of Camel Hair" and "Llamas and Llamaland". 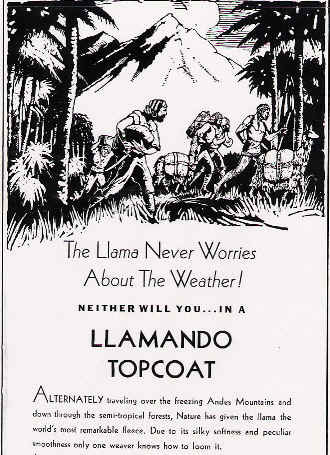 "LLAMA CLOTH - A Lost Art, Retrieved" in which he writes... "It was not until 1921, after years of consistent effort and experiment, that the technicians of S.Stroock & Co, Inc, developed a successful method of weaving 100% llama cloth - a signal and an unchallengeable achievement recognised by the textile industry throughout the world." In that chapter he continues: "Through their own inherent qualities of beauty and appearance, llama fabrics have won a permanent and distinctive place in the world of fashion; and the stylist is now specifying their use wherever a material with characteristics of beauty of drape, natural lustre, and fineness of texture is required." "Llamas and Llamaland" ends with the paragraph "Deep is the gratitude the world owes to Llamaland... Land of the Incas... of glorious antiquity... for its charm and call to adventure... for the secrets of its artistry... and for the lovely fleeces of the llamas which through modern, scientific manufacturing skill, are expressed in all their magnificence in the finished fabric. Here indeed is a lost art, retrieved." In the 1930s and 1940s S.Stroock & Co became a giant in the fashion world of luxury fibres. 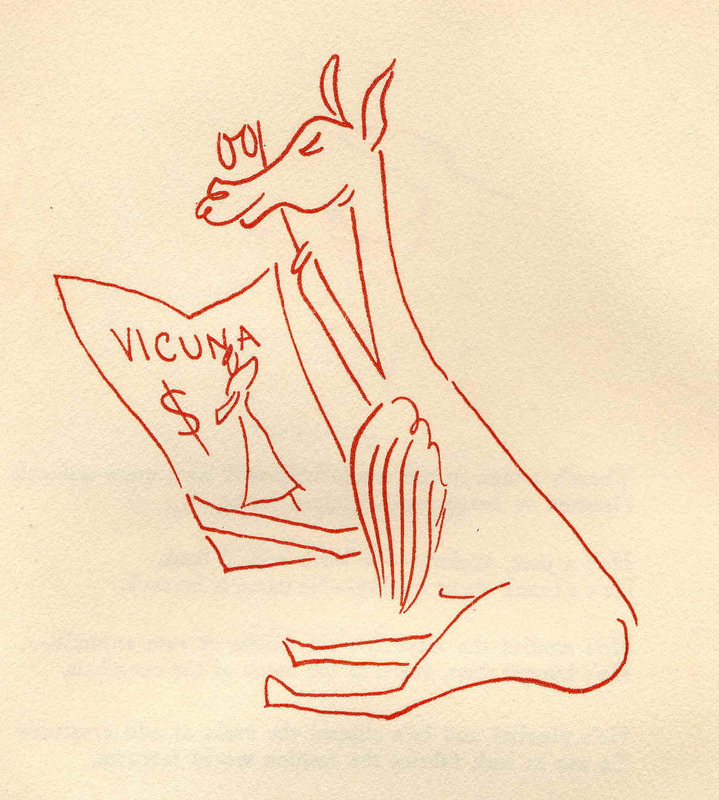 Their Vicuna coats and jackets represented the finest clothing available in the world. 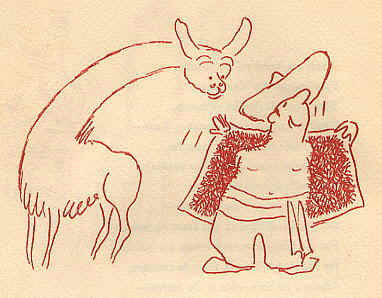 Their llama fabrics were woven into fine men's suiting materials that were marketed exclusively through the Hickey Freeman chain under the label "Llamando"..
Sylvan's prophecy of llama fabric having a permanent place in the world may have been off the mark for he could not predict that his work and techniques might be lost to the vagaries of fashion and a second world war. If you any have information about the Stroock company or their fabrics made from llama fibre*, we would be interested to hear from you. *Stroock carriage & buggy blankets were not made from llama fibre, These blankets were made, we believe, much earlier from horse-hair. We regret, therefore, that we cannot provide any further information about the company's carriage blankets.